If you search for a certain spot in Lake of the Woods County, Minnesota, on Google Maps, you'll see this curious forest formation. So why is there a Minnesota-shaped forest in Northern Minnesota? 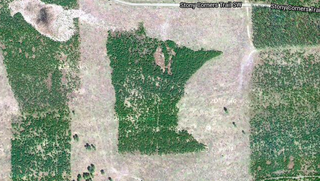 Hello, I have been aware of this timber harvest shaped like the state of MN border for about 8 years. I was a forester in northern Minnesota for some time and I can tell you this. This is state forest land, managed by DNR Division of Forestry. The state employs foresters to design timber harvests to meet many objectives including ecological and economic ones. The forester who designed this timber sale is a veteran at his craft and created this boundary line without the use of gps, but with map and compass instead. The forest type is jack pine, which is an early successional species that colonizes sites after a major disturbance and needs full sun to thrive. This species occurs in fire dependent forests. Modern timber sales mimic the effect of fire in these landscapes. As such this large opening was created to encourage it's regeneration. Loggers are contractors of the landowners/ land managers, and as such do not have discretion as to the layout of the harvest or other design features. They perform the contract. This forester must have an artistic side. And thanks to Google Maps, we all get to enjoy the secret artistry of this forester.